SoftOrbits Photo Retoucher - Face Retouching Tool. Skin and Hair Retouching. Eyes Lips and Body Retouching. Photogenic Beauty in an Instant! People are often worried about how they would look in a photograph. People, especially women, would often wonder: "Are my eyebags too big ? Do I look dark? Does my hair look good?" It is hard for people to admit, but how we look in pictures is a big deal. Unfortunately, not everyone is equally photogenic. Some look too good for the camera, while some should stay from the the camera. Thankfully, a great equalizer has come. SoftOrbits Photo Retoucher can erase eyebags, blemishes, wrinkles, and other imperfections without making it look like your face has undergone face retouching. It has a skin retouching tool that seamlessly erases all the imperfections with ease. Aside from retouching skin, SoftOrbits Photo Retoucher also has a tool that can perform the retouching hair eyes or lips, so you can retouch not only the quality of your skin in the photo, but also how your hair looks, as well as your eyes and your lips. You can erase a stubborn hair strand, you can make your eyeballs appear whiter, or you can make your lips look more pink. With SoftOrbits Photo Retoucher, overall beauty can be achieved without looking fake. Another great thing about SoftOrbits Photo Retoucher is that it is very easy to use. 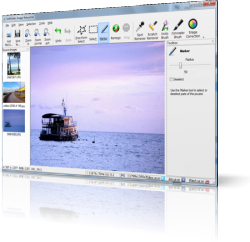 Other photo editing tools require so many steps and a good understanding of the program in order to generate great results. This is very impractical, especially for those who do not have the time to learn the program. Even with the use of tutorials, it will take lots of practice to produce good results. This is not the case of SoftOrbits Photo Retoucher. With the just a few clicks, you can give yourself a quick makeover. You do not have to worry about tutorials or practicing. All you need is to install SoftOrbits Photo Retoucher and photogenic beauty will be yours in an instant.